Paul Jagger MBE has been appointed as president for a two year term of office at Barnsley & Rotherham Chamber of Commerce, with Lisa Pogson of Airmaster Air Conditioning appointed as a new vice-president. Jagger was appointed pro-chancellor of the University of Bradford in April 2006 and chair of its council from August 2006. He became Chair of the corporation at Thomas Rotherham College in July 2013 and is also a councillor on Stocksbridge Town Council. He was educated in Halifax and served an apprenticeship as a plumber in Halifax in the early 1960s. He went on to study Contemporary History and Politics at Salford University in the 1980s. He was regional secretary of the Trades Union Congress for Yorkshire and the Humber for 19 years until October 2005. He was also the president of Sheffield Chamber of Commerce in its 150th year during 2006/07. Paul is the vice-chair of the Committee of University Chairs, chair of the Consultative Council of UCAS and is vice-chair of the national negotiating team at UCEA, for the University sectors pay and conditions. He is also chairs the employers' panel at NEST (National Employers Savings Trust). Lisa Pogson, resources director at Airmaster Air Conditioning Ltd based at Swallownest, Rotherham, was made the newest board member at the Chamber of Commerce in February. Airmaster design, install and maintain bespoke, energy efficient heating and air conditioning systems for a range of market sectors. Lisa also sits on the Retail Sector Forum for the Sheffield City Region Local Enterprise Partnership and is a pro-active member of the Chamber's Women in Business group. The appointments were confirmed at the eighth AGM of the chamber, where it was also confirmed that Helen Jaggar of Berneslai Homes and Matthew Stephens of Gateway Plaza Ltd were elected as new board members. Andrew Denniff, chief executive at Barnsley & Rotherham Chamber of Commerce, said: "I am delighted with all the new appointments and look forward to working with them and the rest of the Board in continuing our recent progress and looking forward with enthusiasm to the future. "I would also wish to place on record my own personal thanks to former president Chris MacCormac, who after many years of service, is standing down from his position as a director and board member." 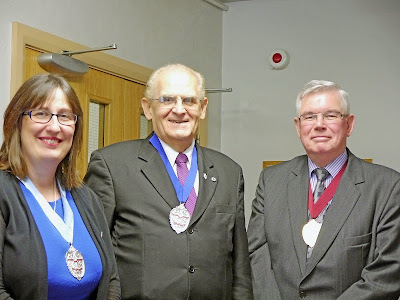 Lisa and Paul are pictured either side of Immediate Past-President Owen Gleadall.